Interface construct are used to connect the design and testbench. An interface is a named bundle of wires, aim of the interfaces is to encapsulate communication. An interface can have parameters, constants, variables, functions and tasks. modports and clocking blocks are explained in later chapters. An interface can be instantiated hierarchically like a module, with or without ports. Interface can have parameters, constants, variables, functions and tasks. allows number of signals to be grouped together and represented as a single port, single port handle is passed instead of multiple signal/ports. interface declaration is made once and the handle is passed across the modeules/components. addition and deletion of signals is easy. 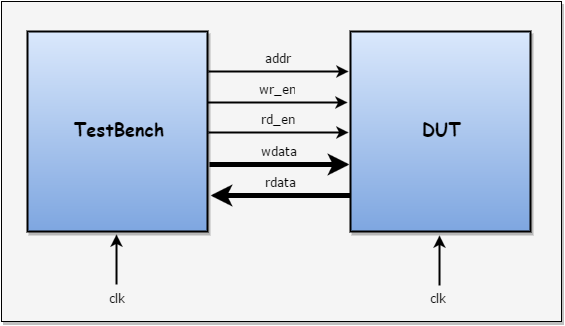 In the example below, testbench has design instance and testcase instance, both are connected through wires. Inside Testcase, environment is created and signals are passed to below hierarchy in order to drive/sample the stimulus, and it passing the signals down the hierarchy goes on. For any addition or deletion of signal/signals need to add/delete in many places, This problem can be overcome by using interface construct. Interface will group the signals, handle to the interface is passed across the hierarchy. Changes made to interface will reflect everywhere. A virtual interface is a variable that represents an interface instance. Virtual interface must be initialized before using it. i.e, Virtual interface must be connected/pointed to the actual interface. accessing the uninitialized virtual interface result in a run-time fatal error. Virtual interfaces can be declared as class properties, which can be initialized procedural or by an argument to new(). Virtual interface variables can be passed as arguments to the tasks, functions, or methods.